According to Amma’s teachers, She was the brightest girl in Her class and never failed to flawlessly memorise a lesson. Amma says it was easy for Her to do so because She only had to read things once to know them by heart. However, when Amma was only in the fourth standard. Her mother became ill, and She had to leave school in order to take care of all the household chores. From then on, it was Amma who made sure all Her brothers and sisters went to school on time and that each day they properly completed their lessons. 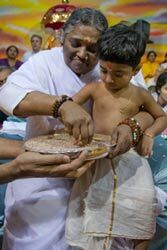 Today, Amma is the highest form of teacher-a Jagat Guru, imparting True Knowledge to the world. Amma says there are two kinds of education: education for life and education for livelihood. Amma says the most important thing is spirituality, or education for life. But at the same time Amma also stresses “education for living.” It is Her wish to bring the two together, creating professionals in all fields with the skills, the mental strength and the heart to uplift the world. Amma has established a vast network of educational institutions that provide the most modern educations while imparting the traditional values of Indian culture. Amma set up Her first educational facility in 1987-the Amrita Vidyalayam primary school in Kodungallur, Kerala. Since then, the Mata Amritanandamayi Math has established more than 60 education facilities throughout India, including engineering, management, journalism, IT and medical schools. Today, the majority of these are part of Amrita Vishwa Vidyapeetham, or Amrita University. Education for life and education for living-in Amma’s hands they have become one.